6.3 earthquake hits northwest of the Kuril Islands. 5.2 earthquake hits near the coast of central Peru. 5.1 earthquake hits northwest of the Kuril Islands. In the Atlantic Ocean: Hurricane Leslie is located about 310 mi…500 km wsw of Lisbon Portugal with maximum sustained winds…75 mph…120 km/h. Present movement…ene or 70 degrees at 38 mph…61 km/h. Remnants of Nadine are located about 1010 mi…1625 km w of the southernmost Cabo Verde islands with maximum sustained winds…35 mph…55 km/h. Present movement…w or 270 degrees at 17 mph…28 km/h. In the Indian Ocean: Tropical cyclone 05a (Luban), located approximately 144 nm south-southeast of Salalah, Oman, is tracking westward at 07 knots. 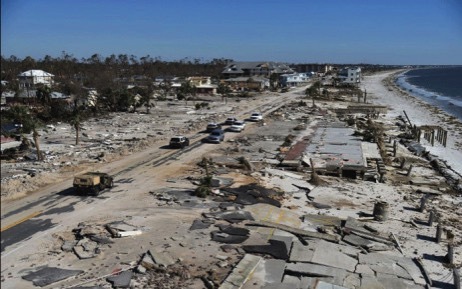 Florida, USA – Searchers on Friday found the first body in the rubble of the Florida coastal town of Mexico Beach, which was nearly obliterated by Hurricane Michael, as the toll from the historic storm rose to at least 17 and was expected to rise. Rescue teams, hampered by power and phone outages, used cadaver dogs, drones and heavy equipment to search for hundreds of people unaccounted for in devastated communities across the Florida Panhandle. North Carolina, USA – Tropical Storm Michael continued it path of destruction as it brought heavy rains and devastating flash floods to North Carolina. Roads were turned into rivers as torrents of water gushed through them. Motorists found themselves taking alternate routes as whole streets became impassable, and low-lying bridges were submerged. Strong winds brought down trees and electricity lines leaving hundreds of thousands of residents without power. According to authorities more than 900,000 homes and businesses across Florida, Alabama and the Carolinas were left without power. Uganda – At least 34 people were killed after mudslides and floods engulfed homes in eastern Uganda, the Uganda Red Cross Society said on Friday. Dozens of people are feared missing and remain unaccounted for after heavy rains triggered mudslides, which washed mountain slopes into houses on Thursday in at least six villages in Bududa district, located on the border with Kenya. Local news outlets are reporting at least 40 deaths. In an Ebola update in the Democratic Republic of the Congo (DRC), the outbreak total climbed to 205 confirmed and probable cases (170 confirmed and 35 probable). According to the WHO, the worrisome security situation in Beni, the epicenter of the epidemic, has contributed to the rise in Ebola cases since September. The Israeli Health Ministry reported today on a imported monkeypox case in an Israeli who lives and works in the Port Harcourt area of southern Nigeria. The man got sick about a week after his return and was diagnosed today according to a report from Jerusalem’s Shaare Zedek Hospital. This follows two imported monkeypox cases in England, also from travelers from Nigeria.